“My mind’s active, but my body complains,” Larry Copenhaver of Sunnyside laughs as he works on an ambitious project to raise and level off a portion of his back yard. 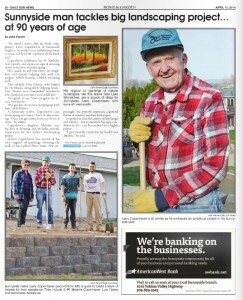 Copenhaver celebrates his 91st birthday next month, and shows no sign of wearing down in his love of landscaping. He’s quick to tell you there are neighbors and friends helping him with the project, which features a block retaining wall. They include Tony Correa, who helped lay the blocks, along with “helping hands” Luis Ybarra and Gammaliel Arredondo who hauled in yard after yard of fill dirt. “It’s great to see how energetic he is,” says Arredondo. “We get lots of exercise keeping up with him,” adds Ybarra. A Sunnyside native, Copenhaver says the landscaping for him is kind of like farming. “Once you get started you can’t leave it alone,” he smiles. 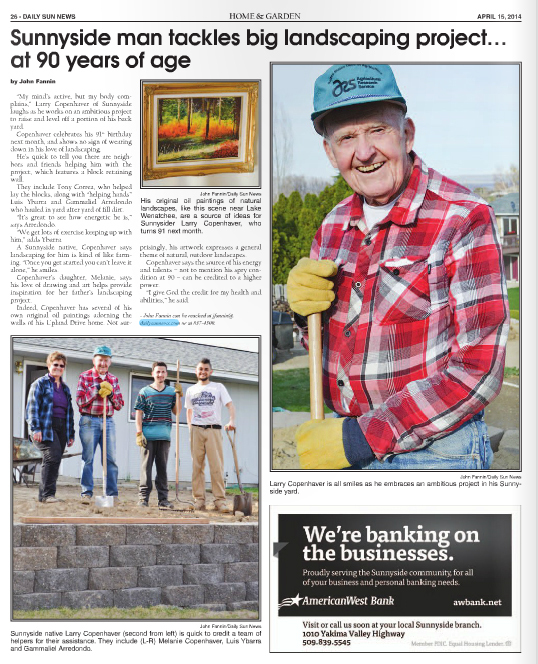 Copenhaver’s daughter, Melanie, says his love of drawing and art helps provide inspiration for her father’s landscaping project.